African National Congress President Chief Albert Luthuli (on left of photo), Mary-Louise Hooper, and an unidentified man in a field. Hooper, an American Quaker, worked as an assistant to Luthuli until she was forced by the South African government to leave the country. 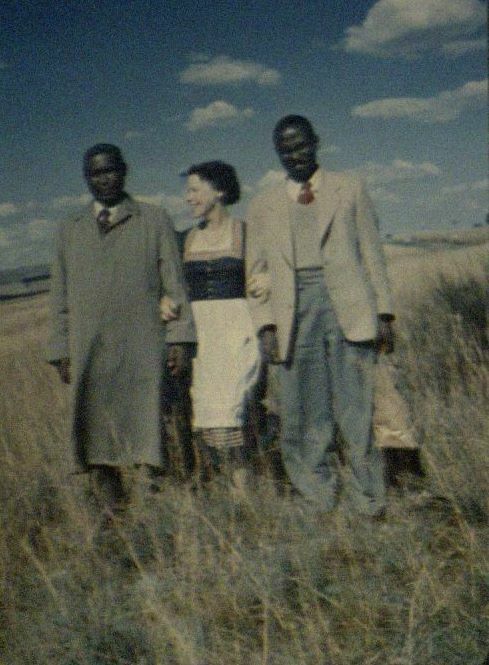 Hooper continued her anti-apartheid activity in the United States working for the American Committee on Africa and remained in contact with Luthuli. Most likely this photograph is in or near Stanger, as Luthuli's movement was restricted to that small town by a banning order.